There are so many evil things that people are interested in today. Vampires, zombies and death are the topic of many television programs, movies and books. Witches and witchcraft are glamorized and the quest for evil spirits that seem to haunt houses has become all the craze. To many this evil is good — they are drawn to the shows, books and rituals. Even some people who call themselves Christian are caught up in this stuff. That being said, what does the Bible say about these evil spirits and about their leader, Satan? Revelation 20:2–3 And he laid hold on the dragon, that old serpent, which is the Devil, and Satan, and bound him a thousand years, And cast him into the bottomless pit, and shut him up, and set a seal upon him, that he should deceive the nations no more, till the thousand years should be fulfilled: and after that he must be loosed a little season. Revelation 20:7–8 And when the thousand years are expired, Satan shall be loosed out of his prison, And shall go out to deceive the nations which are in the four quarters of the earth, Gog and Magog, to gather them together to battle: the number of whom is as the sand of the sea. Genesis 3:4–5 And the serpent said unto the woman, Ye shall not surely die: For God doth know that in the day ye eat thereof, then your eyes shall be opened, and ye shall be as gods, knowing good and evil. 1 Peter 5:8–9 Be sober, be vigilant; because your adversary the devil, as a roaring lion, walketh about, seeking whom he may devour: Whom resist stedfast in the faith, knowing that the same afflictions are accomplished in your brethren that are in the world. 2 Corinthians 4:3–4 But if our gospel be hid, it is hid to them that are lost: In whom the god of this world hath blinded the minds of them which believe not, lest the light of the glorious gospel of Christ, who is the image of God, should shine unto them. John 12:30–31 Jesus answered and said, This voice came not because of me, but for your sakes. Now is the judgment of this world: now shall the prince of this world be cast out. 2 Thessalonians 2:8–10 And then shall that Wicked be revealed, whom the Lord shall consume with the spirit of his mouth, and shall destroy with the brightness of his coming: Even him, whose coming is after the working of Satan with all power and signs and lying wonders, And with all deceivableness of unrighteousness in them that perish; because they received not the love of the truth, that they might be saved. 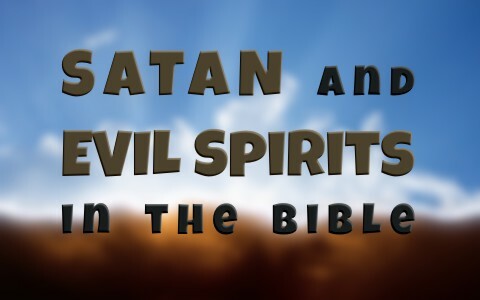 Satan and his demons (evil spirits) are real. They are fallen angels that God allows to tempt, bother and control the minds of humans. Exposing ourselves to satanic and evil programs, books, games and rituals invites these demons into our life. For this reason we should abstain from such things. But the only real defense we have against these wicked spirits is to be indwelled with the Holy Spirit which happens at the moment that we believe in what Jesus did to conquer sin for us personally. The Holy Spirit is greater than any other power on earth or in the air (1 John 4:4). He protects us from the wiles of the devil. Something more for you to read: Does Satan Know His Fate? Next post: What Did Jesus Teach About Marriage?